I needed a cake to serve over Christmas that wasn't too rich, or too sweet. Just something to stave off the sugar cravings and to serve with coffee. 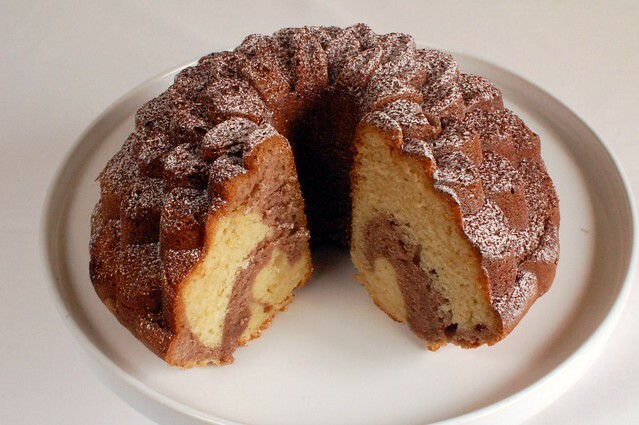 I don't know why Bundt cakes aren't more popular in the UK. 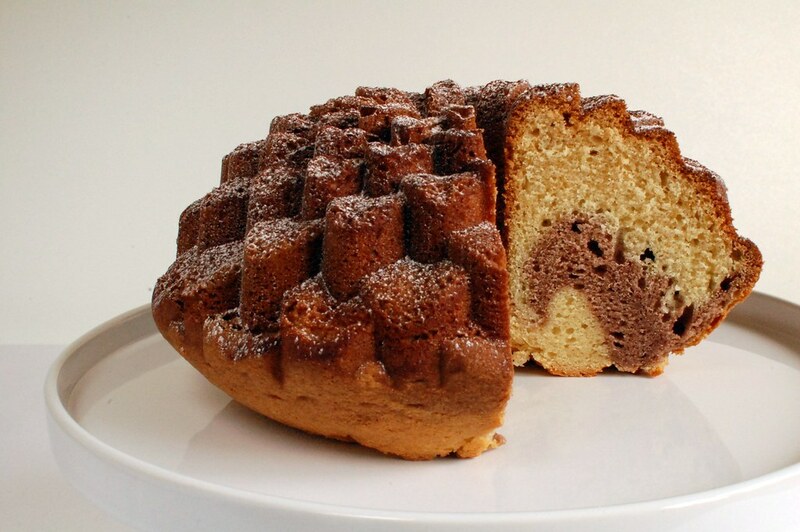 Using a Bundt tin is such an easy way to make an impression and there seem to be a worrying amount of people who think that you've sculpted the cake yourself, on presenting it. The best known brand of tin is produced by Nordic Ware. As Bundts are a US concoction, the best way to discern the volume of batter which any tin can take, is to check how many cups it holds. The standard tin seems to take ten cups, but there are variations on this, so look out. It is absolutely essential that you thoroughly grease and flour every nook and cranny of your chosen tin, before adding the batter. If you fail to do so, you can wave goodbye to your chances of getting the cake out of the tin intact. I use Wilton Cooking Spray for this and sieve in the flour (and some cocoa in this case), before giving the tin a sharp bang over the bin, to get rid of the excess flour. Using sour cream in this makes for a good, dense crumb. Pre-heat the oven to 180C/160C fan, grease and flour the Bundt tin. Mix the sour cream with the bicarbonate of soda and set aside. Beat in the eggs, one at a time to prevent curdling, then slowly beat in the sour cream mixture until well combined and the batter is smooth. Sieve together the flour and baking powder, then fold this into the batter. Divide the batter between two bowls. Stir the vanilla extract into one portion of the batter. Sieve and stir the cocoa powder into the other portion. Use two tablespoons to dollop alternate portions of the batter into the tin. When all the batter is in the tin, give the tin a firm bang on the kitchen counter, to get rid of any air in between the spoonfuls of batter. Then take a skewer and use this to swirl and mix the batter, to create a marbled effect. Bake the cake on the middle oven shelf for 55-60 minutes, until a skewer inserted into the middle of the cake, comes out clean. Leave the cake to cool for ten minutes in the tin, before turning out onto a wire rack to cool completely. When cool, sieve over a dusting of icing sugar, followed with a light dusting of cocoa powder.